The unique capabilities of mobile, context-aware, networked devices make them an interesting platform for applying suggestion in persuasive technologies. Because these devices are nearly always with their owners, can sense relevant information about the context of their use, and nearly always have network access, they enable the principle of kairos, providing the right information at the best time. Relatively little work has examined providing opportunistic, right-time, right-place suggestions or notifications that encourage people to change their behavior. 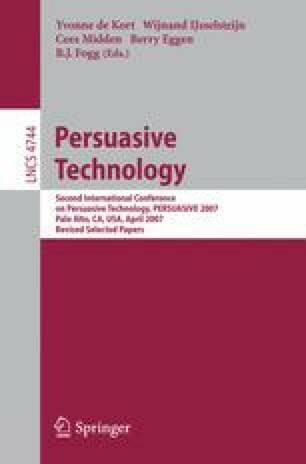 This paper first discusses some of the challenges facing designers incorporating suggestions into their persuasive technologies. We then review a set of relevant persuasive technologies, focusing primarily on technologies in the health domain. We then identify a design space that represents tactics for building persuasive technologies, particularly suggestion technologies. We then explore how this design space of suggestion tactics can be used to evaluate, compare, and inform the design of new persuasive technologies.